Wandope is one of the less familiar fells in the Buttermere scene, and the vast majority of the walkers who cross the fell never visit the summit. The busy path from Whiteless Pike to Coledale Hause runs across the western flank of the fell, and is often using by walkers heading on or off Grasmoor, but very few take the short and not terribly difficult diversion to the grassy summit of Wandope. The best way up Wandope is via Whiteless Pike and Whiteless Edge, starting from Buttermere. It is also possible to climb the fell from the valley of Sail Beck (leading to Newlands Hause). A faint path runs up to the left of Addacomb Beck, then follows the ridge on the southern side of Addacomb Hole to reach the summit. This is a much steeper route. Technically a direct ascent is possible via Coledale Hause - follow the path south from the Hause to the T-Junction - turn left as if heading for Crag Hill, but then right to work around the top of Addacomb Hole to the summit. One could also follow Rannerdale Beck up to Wandope Moss and head across to the summit from there, but neither of these can complete with the Whiteless Pike route. 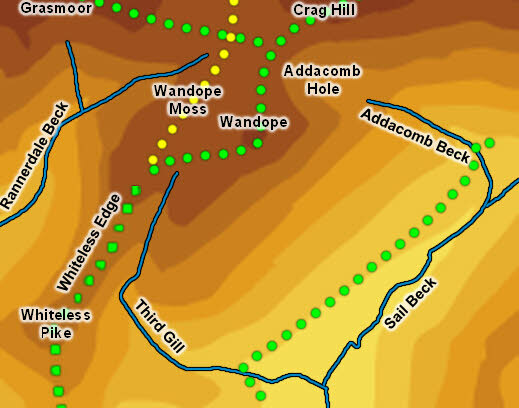 We don't have a walk on Wandope, but our ascent of Grasmoor and Crag Hill can easily be modified to include a visit to the summit by heading around the top of Addacomb Hole. Wandope has a simple grassy summit, with more grass sloping away gently to the west. There are steeper slopes to the east and south. The biggest trap on the fell is the southern spur, which runs down to the east of Third Gill before getting much steeper and difficult. Addacomb Beck rises in Addacomb Hole (north of the summit) and flows east. It runs into Sail Beck, which forms the eastern boundary of the fell. The southern boundary is formed by Third Gill. This rises between Wandope and Whiteless Edge, runs south alongside the edge then turns east to form the boundary, running into Sail Beck. Rannerdale Beck rises in Wandope Moss and flows south-west past the fell, forming the western boundary.